Trying to cross a street in Luang Prabang was not easy for me. Coming from a place where there is a button to push and traffic comes to a halt made me extra cautious when trying to cross a street in Luang Prabang or anywhere else in Laos for that matter. Safety first is my motto. 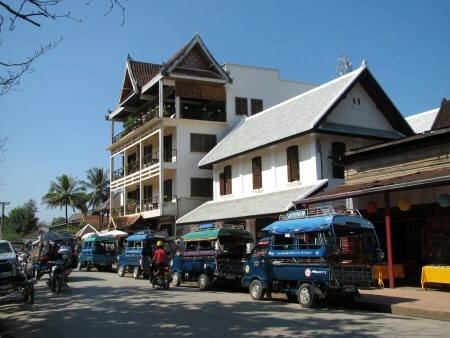 A few meters from the intersection is a busy area with Luang Prabang Tourism Authority, Ancient Luang Prabang Hotel, Hmong Market, banks, radio station, post office branch and ATM machines to pick and choose from.